I'm collaborating with APH this fortnight to give you (or rather your kiddo!) 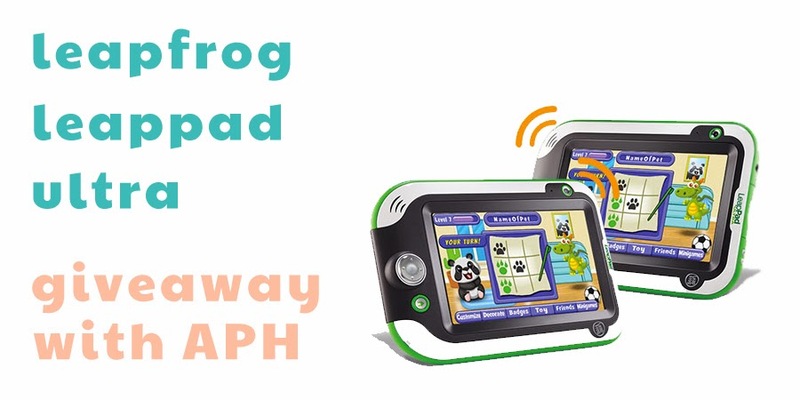 the opportunity to win a LeapFrog Leapad Ultra. I've mentioned before that Tom and I don't drive but we do travel on public transport a lot and often (if it's a long journey) these journeys involve a fair amount of entertaining and distracting! We recently came back from our trip to Dorset and our train journey was extended from the usual 3 hours by almost another hour due to the stormy weather. Three hours is pretty much Wilf's limit, (which is fair enough I think for a two year old, it's pretty much my limit too!). So when all the books, dinosaurs and sticker sheets are exhausted this nifty little tablet would have been pretty useful. Wilf was lucky enough to receive his own Leapad over the weekend and I've been really impressed how durable it is (and slightly freaked out how quickly Wilf knew how to use it). I wouldn't be worried to let him play with this on a train or accidentally drop it and it's designed perfectly for little hands. APH thought a tablet like this would be a great distraction for a long car journey so are offering one lucky reader a LeapFrog Leapad Ulta of their own. To enter just complete the below, competition is UK only and ends on the 27th of January, good luck! apparantly google friend connect doesnt exist anymore so i can't enter! Have i got this wrong? Please allow Rafflecopter competition entry via e-mail, comment, etc. Thanks - I figured it out now, sorry about that! !